Admit Card / Hall Ticket – Entrance exams that can be educational entrance exams or job vacancy filling exams are held in almost every month of a year. During every Institutional internal Exam/ recruitment Exam or Entrance Examination Exam that is held by any reputed organization or Board, candidates need to bring some important elements to the exam for sitting or entering in the examination hall. Hall ticket or admit card is one among those essential things without which the candidate is prohibited to enter into the examination held. In order to check the genuineness of the person, Admit Card / Hall Ticket has made the mandatory thing for the candidates to enter in to the examination hall and appear for the test. Candidate who doesn’t get his admit card/ hall ticket will not be allowed to enter or sit in the examination hall. Hence, all the students are advised to check their hall ticket/admit card and carry it to the examination without fail. To avoid inconvenience, every official website of the institution has provided the facility to download hall ticket/ admit card online. Both the online and offline exams issues Admit card and Hall Ticket to the candidates. If it is online exam then candidate has to download it from the website. If it is offline, then the institution will send it to the candidate’s address by post. If the candidate did not receive the admit card/ hall ticket through post, he can download it by following the below procedure. Visit the link / official website where hall ticket/ admit card is available. Once you on to the website, you will be asked to enter the roll number or application number that is provided to you at the time of applying for the exam. In order to ensure utmost security, sometimes you need to enter your Father's/ Husband's name or D.O.B. (Date of Birth) or any other mandatory details correctly to acquire the Hall Ticket or Admit Card for examination. Once you have entered all the details, click on the ‘SUBMIT’ or ‘OK’ button at the bottom of the page to log-in to your account. Now you can log on to your new account. As soon as you log on a new window will open and the browser will navigate to another page where you can get all the information related to the Examination such as candidates’ details, upcoming result or announced result with link to Hall Ticket and Admit Card. just click on the notification or link indicating to the heading 'Hall Ticket' or 'Admit Card' and go through the information provided over there. As soon as you click on this link, your Hall Ticket/ Admit Card along with the download option will appear on the screen. By just clicking on the Download option, you can download your Admit Card / Hall Ticket which will be saved on your computer within quick time. Candidates can click CTRL+P to take the print out of the form and use it for future correspondence. Some of the major problems faced by the candidates while downloading the Hall Ticket or Admit Card are discussed below. 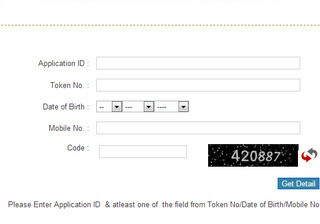 Sometimes the candidates try to download the hall ticket/ admit card without logging in to the account on the website. If this is the issue, candidates have to first log on and try again. This is the commonly appeared notice on the screen. This usually occurs when the candidates enter incorrect details such as roll number, index number or other details. not enrolled', 'Wrong Data provided', 'Wrong Keyword', etc are some other issues that comes under the same category which can be solved by entering the correct details. As number of candidates will be downloading the hall ticket/ admit card from the same server, you face server busy or server slowdown problem. Wait for some time or start applying using other browser to solve this problem.